Police have shot a man dead outside the Dutch central bank in Amsterdam following a massive operation. The man had approached officers brandishing a firearm. 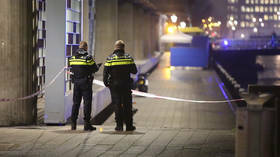 The man was shot around 7:15 pm local time, according to Amsterdam Police. Paramedics arrived at the scene, but the man succumbed to his injuries and died. The man came at officers with a weapon drawn, but it was unclear from the police tweet if he opened fire on them or not. Bystanders told local news network AT5 that they heard around 20 gunshots ring out. One bystander was injured in the crossfire. Gunshots can be heard in a video shot from a passing car. Further footage from the scene shows a massive police response, with the surrounding streets closed off to traffic and trams also being halted. Another video shows emergency services preparing to load the man’s body onto a stretcher. Police also arrested the occupants of a car at a petrol station in the south of the city. A spokesman for the De Nederlandsche Bank told NOS that the incident had nothing to do with the bank.